Helping out the Greater Chicago Food Depository! Dennis McKinnon of the “85 Chicago Bears helps raise money for those in need this Holiday Season! Check out more helpful videos at JenChicago.com! Earlier this week, “Kaner” answered questions about the outdoor battle with the Wings on conference call. “This year it seems to be really high-scoring and real close games. Both games have gone to a shootout, one was 6-5, another 5-4. That’s what the fans want to see. They want to see a lot of goals and a lot of up-tempo, a lot of skill in the game and two fast teams…Every game against the Red Wings is important, especially when we are trying to chase them right now,” he said regarding the team’s bitter rival. Hawks defenseman Brian Campbell, who played in the ’08 Winter Classic gave Kaner some advice about playing in the game. “I think it’s probably going to be a little frustrating out there. The ice is going to be a little different. They are going to have to fix it up a little bit more than you do in a regular game. The game is going to be longer. Sometimes you get cold out there and you’ve got to deal with that too,” Kane said. Kane will unveil and use personally-designed skates and stick during the Winter Classic. Only 88 skates and 88 sticks were created for this special event and Kane, the only player wearing them, will personally sign and auction off a portion of the limited edition product to raise money for breast Cancer research. If you’re like me, you procrastinate about New Year’s and still haven’t made your party plans (maybe I was waiting to be “overwhelmed” with last minute invitations) There are still some great options left. Even with tight budgets there are great deals for a fun night. So don’t just watch the big ball drop on TV go grab some tickets, a date/friend or, just kick start 2009 on your own. Here are a few options ranging from your preference and your area. The Multicultural Meetup Group Is hosting an gala at Drury Lane in Oak Brook Terrace that includes a seated four course dinner, four hour open bar and a champagne toast all for only $60! This is by far the best value. And when you throw in a DJ to keep the party going and you can’t go wrong (you also can’t go broke with the price). You can reserve a nearby hotel room to relax and unwind safely after the party. There are two hotels within walking (stumbling) distance and a third offers shuttle service. Stardust in Downers Grove is definitely the place to be if you want to avoid the downtown scene. Ticket packages start at a low $35. Those are three quick choices, I’m sure there are hundreds but I wanted to give you the highlights on what’s still available. I will see you at one of these parties. Unless you have a better one, I’ll procrastinate another day and wait for those invitations to roll in…..
Paul M. Banks a.k.a. The Sports Bank Despite having a higher record and better national ranking than their opponent, #20 Northwestern (9-3) finds themselves the biggest underdog of the bowl season to #23 Missouri (9-4) in Monday night’s Alamo Bowl. Odds-makers have the Tigers a two touchdown favorite over the Wildcats in this San Antonio battle of los gatos peligrosos. On paper, it’s strength versus strength: Northwestern’s 23rd ranking scoring defense versus Mizzou’s 6th ranked offense. If NU wins this side of the ball, they should have their first bowl victory since 1949. Missouri has huge playmakers everywhere on offense- senior QB Chase Daniel (358 of 484-4,135-37 TDs-15 INT) who often finds electrifying WR Jeremy Maclin (95-1,221-12 TDs) and TE Chase Coffman (83-920-10 TDs). Oh, and the backup QB is named Chase Patton, just in case you thought this team didn’t have enough people with that obscure first name already. (Does Missouri have Chase Bank as one of their sponsors?) And don’t forget tailback Derrick Washington (162-992-17 TDs). Daniel’s NFL Draft stock is about as high valued as Washington Mutual due to his lack of size. He’s listed at 6’0”, but in reality he’s as close to being 6 as I am to being 9 feet tall. 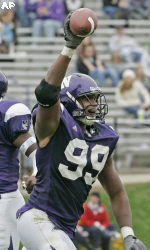 NU’s primary strength this year has been their defensive line, so when they get near Daniel, they must “throw their hands way up in the air and wave ‘em around like you just don’t care,” to disrupt Chase’s passing-lanes vision or (better yet) deflect his passes and hopefully pick off a couple. This is highly doable considering team MVP and DE Corey Wootton is 6’7”, NFL bound DT John Gill is 6’3,” and the rest of the line is that height or taller. Prediction- Northwestern 28, Missouri 24. Is 2008 the year of the underdog? Ask the Celtics, Giants, and Phillies! Or maybe I’m just drinking purple colored Kool-Aid. FOR THE FULL IN-DEPTH VERSION OF THIS PREVIEW/PROFILE OF THIS GAME CLICK HERE. Who doesn’t look forward to that midnight kiss on New Year’s Eve? The anticipation builds all night long, and it’s over in an instant. So why not smooch with your sweetie at the stroke of midnight twice? This New Year’s Eve, the Globe Pub (1934 West Irving Park Road) will ring in the British New Year at 6 p.m., then the celebration will continue until the stroke of midnight out time. Usually when prominent government and business leaders descend upon Wrigley Field to discuss a game being played there, the temperature’s more likely to be near 90 than zero. However, the second annual NHL Winter Classic is no ordinary game; neither are the bread and circuses surrounding it. Mayor Richard Daley, joined by Blackhawks Chairman Rocky Wirtz, Blackhawks President John McDonough, and Cubs Chairman Crane Kenney came to Wrigley Monday for a special press event in advance of the much-anticipated outdoor regular-season game between the Hawks and their bitter rival, the Detroit Red Wings, on New Year’s Day. On a day with the temperature and wind-chill more suited for the Yukon Territories than Chicago, Daley and the execs toured the current field’s infrastructure, led by the NHL’s Don Renzulli (Senior Vice President of Events), and Dan Craig (Facilities Operations Manager). This is the team transforming Wrigley Field, one of baseball’s cathedrals, into a hockey experience. Following the tour, a fedora-clad Daley and the executives talked about the event in a nice WARM Wrigley Field press room. After the speeches, Rocky presented Hizzoner with a special Winter Classic jersey with “Daley 09” stitched on the back. “As the first hockey game to be played at Wrigley Field, this game is already part of Chicago sports history,” Daley said. 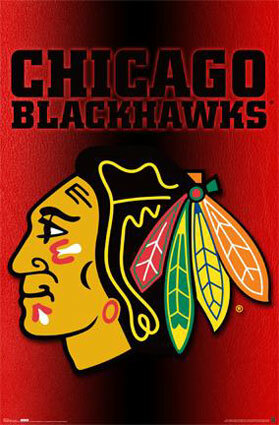 The Hawks are both the NHL’s hottest team with seven straight wins and the current leader in home attendance. They will play the defending Stanley Cup Champion Detroit Red Wings for a record 701st time. No other NHL series can boast of as many meetings as this one. In the NFL, the record is held by the hometown Bears and Green Bay Packers. Wirtz appropriately drew an analogy between the two rivalries when describing the upcoming Winter Classic’s atmosphere. “I also want to thank all those Chicago Bears fans who are going to be out watching the Bears beat Green Bay today, because that’s going to be much like the Chicago Blackhawks fans who are going to be following the Blackhawks on a day like today,” Wirtz said.